This is jewelry and is another opportunity for us to play the Whatzit game. Those of you who know what this is please give everyone else a chance to hazard a guess first. It looks the same on the other side. If an additional hint is needed I can post more photos. Great piece, Scott. I think I know what it is so I will hold my guess for now. I will venture to guess with tongue firmly placed in cheek. Few people are aware that these were reliquaries with a cross section of the TransAtlantic cable sealed inside. 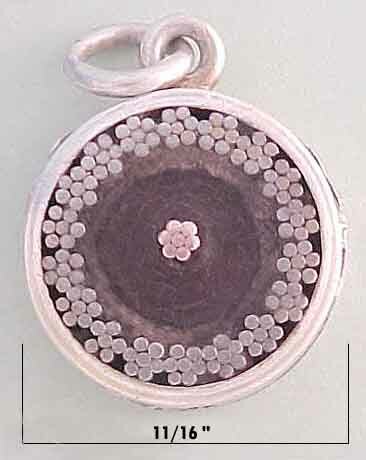 The seven strand lines are made to look like a miniature version of the original historic cable. These were given to each of the participants at either side of the Atlantic when the project was completed. Reference: "Little Known Facts and Less Known Truths"
reliquaries-- A receptacle, such as a coffer or shrine, for keeping or displaying sacred relics. Well there is no fooling you people. I received email from several who knew what it is. I appreciate the e-mail and understand that you would like to know if you are correct without spoiling everyone's fun guessing. As of 3 pm EST all of the emails have been correct - except one. I have e-mailed the one wrong answer so they can guess again. If you are not certain please post your guess here. I liked the wrong answer. The wrong answer: A small candle where the wick is nearly gone. Used as a watch fob for emergency lighting. Am I correct in thinking that most or all of these were made by Tiffany? Scott, is your example signed? Ok, it appears that no one wants to suggest anything else. Fred is mostly correct. It is a piece of the actual cable. More on this later. But first here are the additional photos. 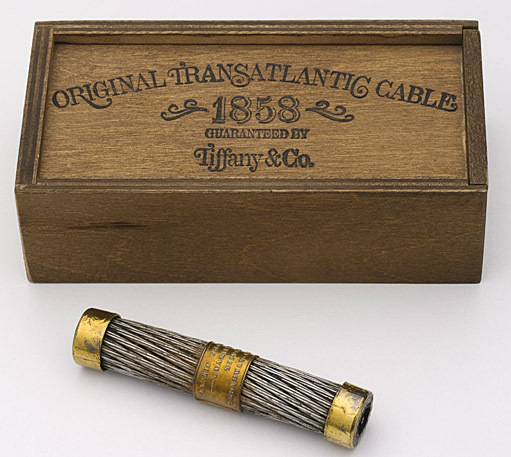 There were several Transatlantic Cables. This is an actual piece of the "shore end" part of 1858 Transatlantic Cable. The main trunk is larger than the "shore ends" and it all made up the 1858 Transatlantic Cable. Paul, my piece is not marked. In this country Tiffany is best known for making such souvenirs. I am not sure who is best known for making such souvenirs in the UK. You must believe me when I say that I had no idea that the lore I was spinning had any truth to it.... I was delighted to have come up with this far fetched tale and even made-up the reference. As fare as I know there is no such booklet "Little Known Facts and Less Known Truths". I did know that the configuration of seven rods makes a tightly twisted cable. It looks as if the pendant you show is sterling through and through. Is that correct? Scott, the decoration on this little piece is superb. The symbolism represented by the embossed figures is clear. When first I saw your post with Freds' reply. I recognized a coaxial cable, but thought it too small for a transatlantic cable, and therefore later in origin. The item was too large to go on a charm bracelet, and too small for a key tag, so I was stumped. Now knowing the acatual age, I can hazard a guess (I really don't know for certain) -- I think it is too macho to hang from a ladies' chatelaine, but I can envision it hanging in front of a man's vest from a watch chain. I would therefore guess a watch fob. Have you looked for hidden initials of a designer or manufacturer? Could that objece immediately behind the lion be "D" or perhaps a "D" superimposed over a "T"? I believe the object behind the lion is the Irish harp. An Irish harp it is. Ageing eyes, I'm afraid. I believe you. A great guess and a believable spin. 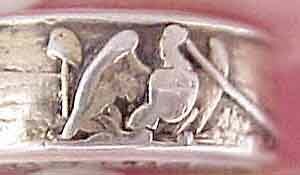 It is not marked and I am not about to test it but I am certain the band is sterling with vermeil. 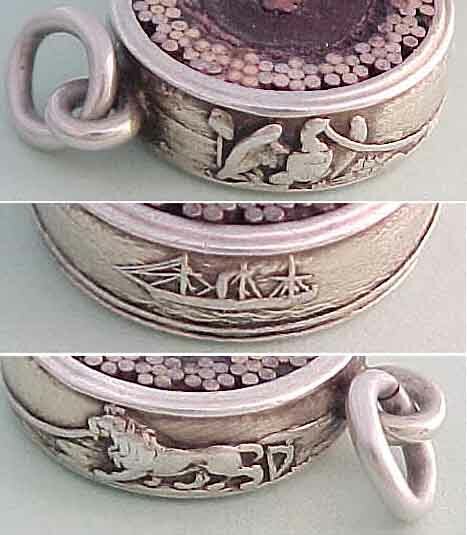 With all the excitement about it being a bit of the Transatlantic Cable I forgot to say that it is a watch fob. Thanks for mentioning it. I agree, the decoration is superb. When I first held it my hand I knew it was the cable and didn't really notice the decoration until after we purchased it. The decoration felt like a surprise bonus. When I first got it, I too thought it was a conjoined letter behind the lion. But upon closer inspection it is clearly the Irish Harp. I just got it out of storage again and gave it another look with my best loop and brightest light. It may just be my old eyes but what might be marks (if they were really marks) are not clear enough to even speculate about. 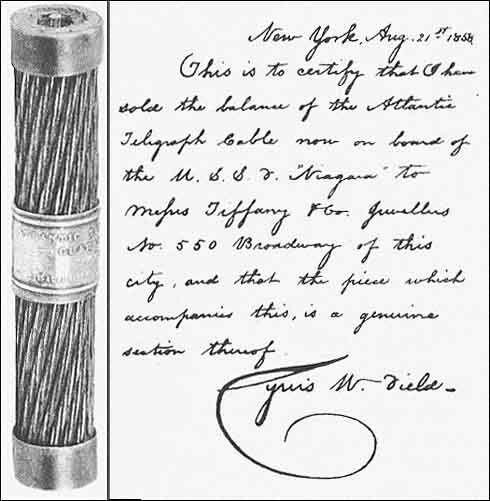 I believe the best known Transatlantic Cable souvenir was a several inch long piece of the cable with Tiffany sterling end caps and a center band/plate with a commemorative inscription. This was accompanied by a letter of authenticity from Cyrus W. Field. I have been thinking about the Irish Harp behind the lion. So I took another look at the eagle and there is something behind it as well. I am not sure what it is. It kind of looks like a shovel standing on end (handle down). 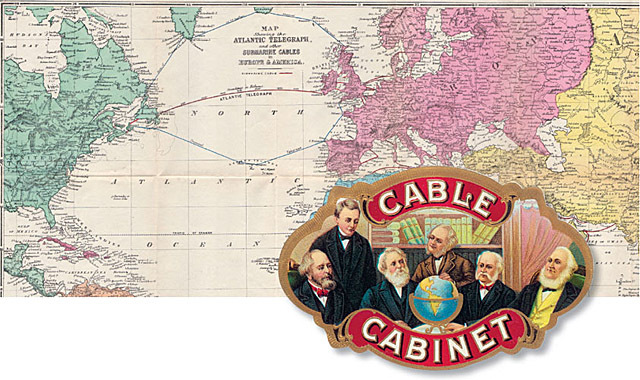 The Transatlantic cable was a UK and USA project. I took a look at a map of the Transatlantic Cable route. It comes ashore in Ireland and New Foundland. So the Irish harp makes sense. But I am just guessing that it is a shovel behind the eagle. I suppose it could have something to do with Canadian mining. Does anyone know? While it may look like a mushroom, I believe it to be a "Liberty cap" - the type of cap that appears on the Liberty bust on the obverse of the 50 cent piece from the early 1800's, as well as on other period depictions of the figure. The post supporting the cap depicted on the fob appears to be acting as a hat rest. There is a symbolism to this type of cap (a peasant or citizen's cap? ), and to its placement on Liberty's head, but I am not sure I remember correctly what it is (perhaps egalitarianism - the rise of a downtrodden peasant or citizen class against its opressors?). Supposedly the Liberty Cap was worn by Roman slaves during the ceremony when they were granted their freedom. At least that was the belief in the latter 18th century, when the cap became symbolic both in America and France. It was depicted on a pole in the emblems and flags of several South American countries as well. 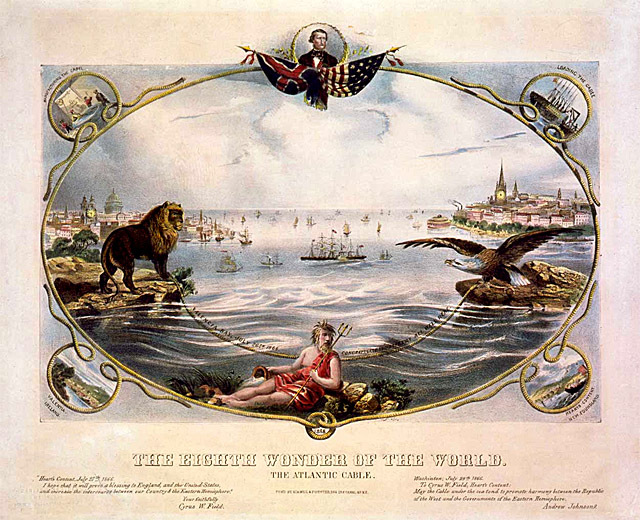 So I guess Swarter is spot on: a nice image to counter Britannia's lion, with the rather pointed reference in the Irish harp to Britain's troubled colony! I suppose it could be a Liberty Cap. I don't know that much about Canadian history but it doesn't really work for me. The Liberty Cap goes back in history. Almost anywhere there has been a revolution there was someone using the symbolic reference of a Liberty Cap. I haven't found anything that would indicate that the Liberty Cap would be a meaningful reference (on the same scale as the Irish Harp) to Canada, Nova Scotia, or New Foundland. In North America, as I understand it, the Liberty Cap was worn by members of the Sons of Liberty who were opposed to British rule. So it's use would seem like it might be a little insulting to the Transatlantic Cable's UK partner. Here is an 1838 half-dollar (it is worn, and had been pierced to be worn as a medallion, and later bent and broken, but it is the only example I have). On the obverse is a bust of Liberty wearing the cap, and on the reverse is the Federal eagle with the U.S. shield on its breast. These two American symbols are thus linked, and could be expected to have been used together on the fob. Use of the cap on the fob may have been only for purposes of symmetry, and may have no symbolic relationship to the Irish harp, unless there was intended an oblique reference to English rule over Ireland (a sentiment which would appear counter to the theme of union across the ocean). Thanks, Patrick, for the reference to the discussion of the history of the cap. I just can't shake the feeling that the thing behind the Eagle should have something to do with Canada, Nova Scotia, or New Foundland. Until there is evidence to the contrary, I will accept the symmetry rationale. Thanks to you both for the education about the Liberty Cap and Pole. I am still curious to find out what the symbol behind the eagle is? I suppose it could be a liberty cap but I am not sure. Maybe one of our new members who hasn't seen this thread knowns something more? 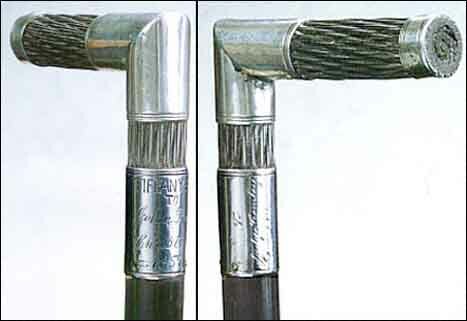 One of the English manufacturers of the cable also issued souvenir lengths of the cable so it is possible a UK or Canadian silversmith acquired pieces and mounted these for sale. 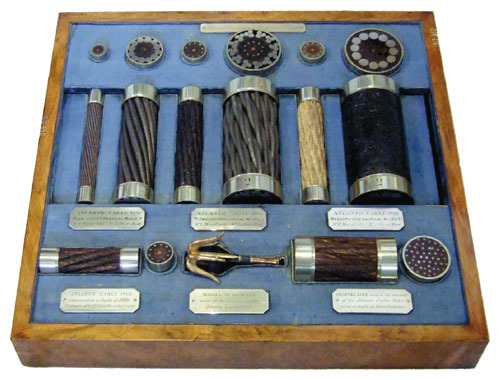 One piece is four inches long with brass ferrules either end and a band round the centre that states that it is "A part of the Atlantic submarine telegraph cable manufactured by Messrs Glass, Elliot & Co. London." Here's another souvenir cable offer that was done a little earlier in 1858 and included ten acres of land and etc. for every thirty dollars worth of subscriptions. That's it! That's how we can save the beleaguered newspaper industry! What shall we give away? Motherboards from the first computers to run desktop publishing programs, made into watch fobs? This is a great find Scott! The May/June issue of American Scientist has an interesting article on the effort that went into the laying of this cable. It should still be on the newsstand of your favorite bookstore. The first telegraph cable to span the Atlantic revolutionized communication, but it also transformed business, politics, and even language. Cyrus West Field was such a driven man that he would even enter a room quickly, yet his life was on the brink of idleness. At the age of 34 in 1854, Field had already made a fortune in the paper industry, and faced early retirement without any new projects on his horizon. He was no stranger to hard work: The seventh son of a poor country preacher, he had left his Stockbridge, Massachusetts, home for New York City in 1835, at the age of 16, with $25 and his father’s blessing. Field initially scraped by as a stock boy. He recorded every personal expense, and this discipline helped him steadily climb up the ladder of success. He had also been lonely: He had regularly sent letters home begging for someone to write back. Ultimately, his work ethic solved both problems, setting him on a circuitous path from paper to telegraphy and creating a communication network that alleviated homesickness and isolation for people around the world. The turning point in Field’s life occurred on a cold evening in January 1854, when he received an unfamiliar visitor to his Gramercy Park mansion. His brother, Matthew Field, had invited over a man named Frederic Newton Gisborne, who was down on his luck. Gisborne, a British engineer living in Newfoundland, had been smitten by telegraphy and dreamed of wiring the island of Newfoundland and connecting it to the mainland, and from there to New York. Newfoundland is the easternmost part of North America and sits only 2,000 miles from Europe. A European ship carrying news across the Atlantic would shave off a day of travel by docking at this easterly point. It was a clever idea, but Gisborne miscalculated the difficulty. Newfoundland possessed an untamed and unforgiving landscape. Simply surveying 400 miles of it took Gisborne several months, and installing telegraph wires proved nearly impossible. His financial backers withdrew, leaving him unable to pay his debts. He lost everything and went to jail. After his release, he traveled to New York City to find other funders. A chance meeting with Matthew Field brought him to his encounter with Cyrus—and that meeting changed everything. Gisborne, a strapping and bearded man with thick weathered hands, sat across from tall and thin Cyrus Field, who had a delicate air. Field listened, intrigued but unconvinced, to Gisborne’s proposal to shorten the arrival time of a message by a day. After examining the globe in his library, the thought dawned on Field that the span to connect Newfoundland nearly matched the distance across the Atlantic Ocean. It occurred to Field that a much more worthwhile accomplishment would be to cut the entire travel time for transatlantic messages, rather than merely shaving off one day. In an earlier expedition, Maury serendipitously measured the cable’s path between Ireland and Newfoundland and surmised that there was a raised, flat section that he called the “Telegraphic Plateau.” (Interestingly, the Telegraphic Plateau was found years later to be untrue. The wide spacing between soundings had led Maury to conclude that the seafloor was relatively flat, but actually it wasn’t.) Moreover, Maury collected samples of the ocean floor, which contained shells, diatoms, and fragments of sea life. The lack of sand indicated that the water was calm and the floor was undisturbed. In addition to a peaceful ocean bottom, this electrically transmitting cable needed protection from the conductive seawater. That answer came from a milky sap from a Malaysian plant with the strange name of gutta percha. A natural plastic, gutta percha forms easily in hot water, and becomes firm but flexible when cooled. Scientists such as Michael Faraday, James Clerk Maxwell, and Lord Kelvin claimed its insulating behavior to be superior to the popular Indian rubber, which was difficult to work with and often degraded. 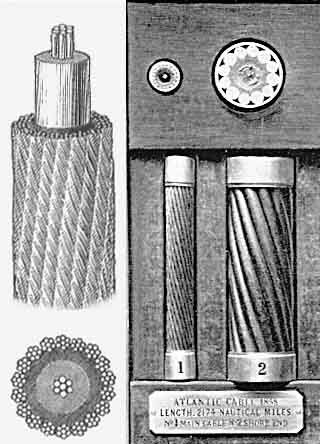 The mighty cable needed to be composed of a core of seven copper wires coated with gutta percha and protected by an outer sheath of iron wires and hemp. Field also needed to understand if electrical signals could travel long distances, and contacted Samuel Finley Breese Morse, the creator of the code of dots and dashes that bears his name. Morse had connected America’s first telegraph cable between Baltimore and Washington, DC and dispatched the first (and foreboding) message: “What hath God wrought?” Unbeknownst to Field, Morse had experimented with submerged cables and successfully conveyed messages along them. 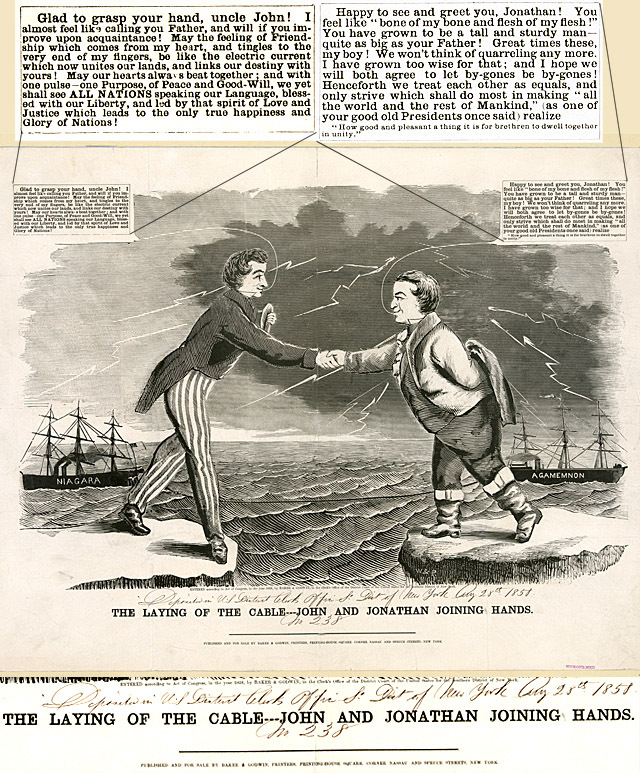 Morse had even predicted in 1843 that “telegraph communication may with certainty be established cross the Atlantic Ocean.” With these reassuring bits of information, Field set out to stitch the Atlantic with threads of copper. Copper is an old friend to civilization. The Bronze Age has copper to thank for it, because bronze contains copper and tin. Copper was a main ingredient of Julia Child’s first recipe, which wasn’t whipped egg whites for meringue in a copper bowl. Quite the contrary, in World War II, Child concocted foul-smelling copper acetate for shark repellant while working at the Office of Strategic Services (the early CIA). Today, copper serves humanity by bringing power and data to our devices along electrical cords and within integrated circuits. In Field’s time, copper ushered society into modernity by knitting together both sides of the Atlantic. Two tasks confronted Field: Connect Newfoundland and then connect the Atlantic. Neither would be easy. Although Gisborne had been the originator of the idea and later played a minor role as an engineer before returning to Canada to pursue his own career in telegraphy, the cable project needed Field’s business acumen and determination. Newfoundland, with its hostile terrain, wild seas, and menacing icebergs, did not invite the timid. Field and his team of workers endured. After months of struggle to string copper wires across this harsh wilderness, Field was rewarded with the unparalleled and hardest job of all: wiring the vast Atlantic. 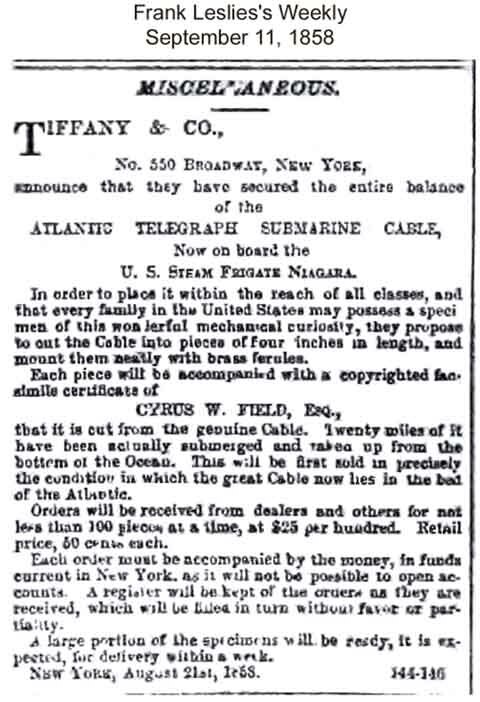 The first attempt to stretch the cable across the Atlantic started in August 1857. Two ships—the USS Niagara and the HMS Agamemnon—met in Ireland each holding half the load (no craft at the time could carry the entire cargo). Heading westward together, the plan was for one boat to discharge its haul and then splice its line’s end to the length on the second accompanying ship. All went smoothly until the 335-mile mark, when an accident occurred with the cable’s payout machine. The cable snapped and was lost. The second attempt in 1858 made improvements and installed a better payout machine. This time the boats met in the middle of the Atlantic and the vessels headed to opposite shores with the ends of the cables connected. The ships kept in contact constantly and checked the cable continuously. Lord Kelvin, who acted as a scientist on the project, devised an invention called a mirror galvanometer to monitor the health of the cable. This contraption amplified and projected the tiny signal onto a screen to distinguish dots and dashes. After a mighty and damaging storm passed and the squalls quieted, the ships parted with their cables joined. At the 80-mile mark, the signal went silent, so the vessels rendezvoused and re-spliced. After the repair, there were smooth payouts until the 200th mile when the signal faded and never returned. After this second failed attempt, both vessels headed quickly to England in mid-July. Disappointed but undeterred, Cyrus Field realized there were enough summer months for another bid if preparations happened briskly. With a swift turnaround, a third attempt was made in July 1858. Both ships met in the middle of the Atlantic and deposited their copper strands while moving in opposite directions. By the end of the first day, the signal mysteriously went away, then miraculously returned. Other problems arose. The magnetic pull of the iron protection around the cable compromised compass readings and caused the Niagara to go off course, which wasted the precious payload that threatened to run out. Fortunately, a small accompanying ship led the way and the Niagara arrived at Newfoundland with a working cable. On the other end, the Agamemnon overcame its troubles as well, and soon reached the Irish shores with an operating copper line too. Triumph came at last. Cyrus Field sent the first official message across the transatlantic cable on August 16, 1858, of “Glory to God in the highest; on earth, peace and good will toward men.” (Actually, with all of the testing, it was the 129th message and sent on the seventh day of operation.) To commemorate the occasion, Queen Victoria sent a 98-word congratulatory message to President James Buchanan, who responded with a flowery 149-word reply. The former took 16 hours to transmit; the latter came in 10. The telegraph engineers noticed that when a dash emerged from the cable, a dot rushed right behind it, making a message hard to understand. The electrical signals underwent signal retardation, whereby they spread into weaker and longer pulses, which relegated the engineers to the time-consuming work of confirming and repeating messages. Edward O. Wildman Whitehouse, a medical doctor turned ill-informed amateur electrician, was the cable’s chief science advisor and quarreled with Lord Kelvin on how to resolve this problem. Kelvin knew that transmitting signals underwater would not be easy because the doctrine of squares applied; that is, the speed of the message decreased as the square of the total length of the wire. Kelvin’s approach was to make signals shorter (and he was ultimately proven correct). Whitehouse’s thinking was to amplify the signal by increasing the voltage. His solution proved disastrous. When Whitehouse tested it, he roasted the cable and it never worked again. With four weeks of life, 400 messages were sent. The cable briefly gave, and then took away, something that the public much desired. As a result there was a huge uproar against Cyrus Field. People felt swindled and thought transatlantic communication was fake. Field nearly went bankrupt and failed to secure further backing. In time, however, attention moved away from this clamor. The United States entered the Civil War, and the public had more pressing worries than the cable. During the war, Field persevered in the behind-the-scenes groundwork of organizing and funding another working cable. He was well rewarded for his renewed effort. 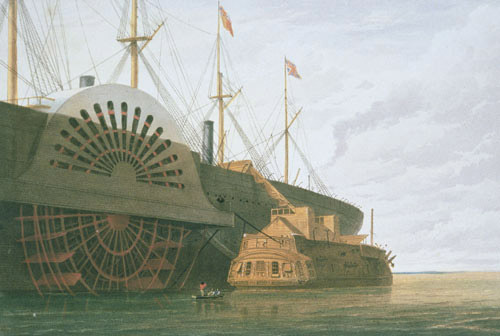 Since his last attempt, a mammoth ship that could carry the whole cable was built—the Great Eastern. Engineer Isambard Brunel created the Great Eastern to connect the British Commonwealth, running between England, Australia, and India without refueling. But the boat hit on hard times and was on auction at a fraction of its cost. Field believed the Great Eastern could reduce the chance for failure, so soon it became the copper cable’s new mode of transportation. On the fourth attempt in 1865, the Great Eastern engulfed the entire cable and set sail for Newfoundland from Valentia, Ireland. However, at the 80-mile mark trouble came. The signal weakened and the cable needed to be retrieved. The gargantuan hull took nearly two days to reverse and recover the bad section of wire. Eventually, a small iron nail was found embedded in the cable. Four days later, trouble returned. Another nail. With thoughts of sabotage on his mind, Field kept watch, but evidence of any purposeful tampering never emerged. In the next three days, hundreds of miles spewed out successfully until suddenly a defective part of wire went over at the 1,200-mile mark and broke. The captain of the ship tried to retrieve the snapped end with a grappling hook and rope, using the tension of the rope as a way to “feel” for the lost cable on the ocean bottom. After four attempts, each taking several days, the Great Eastern was forced to stop. Supplies, food, and morale on the ship were perilously low. A buoy was left where the broken line rested. With triumph nearing, the fifth attempt saw a new cable quickly fabricated and a new grappling system installed. The ship set sail on Friday the 13th of July 1866, but that omen was disregarded. With near ease, the Great Eastern reached Newfoundland and moored in the deepest harbor that could accommodate it—a small fishing village of 400 people called Heart’s Content. The cable was brought on shore and tested, and found to be alive and well. Celebrations commenced, but Field was preoccupied. He wanted to rescue the lost strand. In three short days, the Great Eastern returned to the broken line. After 30 attempts to raise it from the deep, the wire was recovered and spliced to a new length, and the Great Eastern headed back with the second working cable. Finally, Cyrus Field succeeded. After eight years from the first attempt, he had firmly tied together the two sides of the Atlantic. Like any innovator, Field would have had difficulty anticipating the impact of his creation, but hoped that it could be used to prevent misunderstandings between nations and “disarm all prejudice.” There are certainly instances where a transatlantic message would have created different outcomes. Take the War of 1812, for example. France, England, and the United States fought each other in the bloody Battle of New Orleans in 1814. America won under the leadership of General Andrew Jackson, which made his bid for the presidency straightforward. There was a problem, however. A truce was reached before the battle began; the news took weeks to arrive from Europe. Had the copper cable existed, lives could have been saved and there might be a different portrait on the $20 bill. Such an historical event speaks to the profound impact of the cable. But, admittedly, pinpointing all of its consequences is difficult. Nevertheless, the copper cable provides lessons on how technology shifts life. Before the cable, Heart’s Content, Newfoundland was a small fishing hamlet. After the cable, a new social class of well-off cable station workers usurped this quiet village, causing friction by bringing in expensive amenities and squeezing out the original residents. Replace “cable station” with “Internet companies” and “Heart’s Content” with “San Francisco Bay Area” and this 19th-century incident closely mirrors examples from the modern day. Cyrus Field hoped the cable would increase communication, build business, and prevent conflicts. In an 1862 address to the American Geographical and Statistical Society in New York, he proclaimed that “its value can hardly be estimated to the commerce, and even to the peace, of the world.” Scholars claim it did those things, and it also compressed time and space, separated information from geography, increased globalization, jumpstarted journalism, and tightened imperialism. But the role of the cable did not stop there. The copper cable and telegraph made surprising modifications, particularly in language. Transmitting a message cost about $100 to send 10 words in 1866 (about $1,300 today). This cost squeezed the language of the news into a sparse and neutral style. Ernest Hemingway, who was once a journalist, credited his venerable prose from working in a newsroom. And he and his writing style went on to inspire generations thereafter. The telegraph cable started a linguistic evolution that continues today, as technology now sculpts language with constraints of 140 characters, the offering of emoticons, and the flourishing of acronyms. How language will settle, if at all, remains a mystery. What is certain is that humankind creates technology and then technology re-creates humankind. The cable was yet another instance where copper, an old friend, played a significant part in transforming civilization. After the telegraph, copper telephone wires followed in the 1950s, and Field’s technology remained largely unchanged for more than a century, until fiber-optic cables were installed in the 1980s. That first copper cable was the starting entry in a system of linkages that have continued to evolve, but still fulfill the same basic goals: linking lives, speeding communication, and combating loneliness. Clarke, A. 1975. Voice Across the Sea. New York: HarperCollins. Cookson, G. 2006. The Cable, 2nd Ed. Gloucestershire, UK: Tempus Publishing. Dibner, B. 1959. 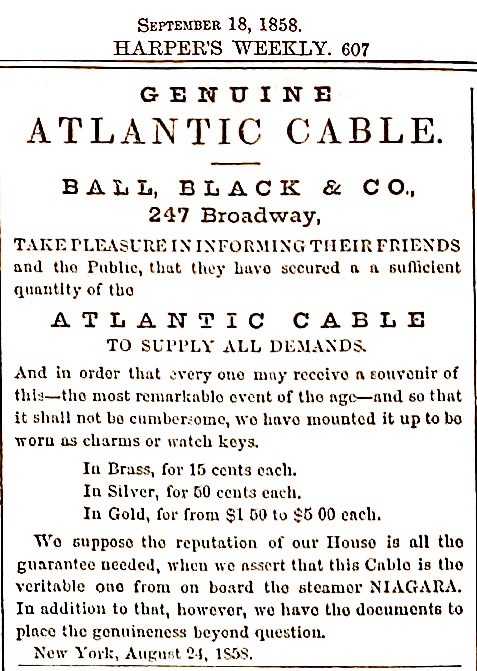 The Atlantic Cable. Norwalk, CT: Burndy Library. Tarrant , D. R. 1999. Atlantic Sentinel. St. John’s, Newfoundland: Flanker Press. 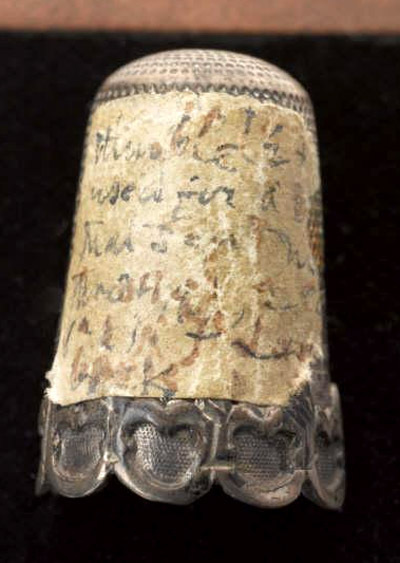 A SILVER thimble of historic interest has recently been present to the Science Museum, South Kensington, London, by Mr. R. B. Fitzgerald, nephew of the late Miss Emily Fitzgerald. The latter was the daughter of the Knight of Kerry upon whose land was built the telegraph house in which were terminated the first two Atlantic cables. After repeated failures in 1857 and 1858, the two cables from Valentia in Ireland to Newfoundland were successfully laid, and as an experiment they were connected together in Newfoundland so as to form from the Ireland end a continuous circuit some 3,700 miles in length. A cell was devised by borrowing Miss Fitzgerald’s thimble, filling it with a few drops of acid and inserting a zinc wire. The current from this cell, which traversed the Atlantic and returned back again, was sufficiently strong to produce large deflections on the reflecting galvanometer which had been recently devised by Prof. William Thomson, later Lord Kelvin. — Mr. Latimer Clark — who went to Valentia to test the cable for the "Atlantic" Company — had the conductor of the two lines joined together at the Newfoundland end, thus forming an unbroken length of 3,700 miles in circuit. He then placed some pure sulfuric acid in a silver thimble,(*1) with a fragment of zinc weighing a gram or two - By this primitive agency he succeeded in conveying signals twice through the breadth of the Atlantic Ocean in little more than a second of time after making contact. The deflections were not of a dubious character, but full and strong, the spot of light traversing freely over a space of 2 inches or more, from which it was manifest that an even smaller battery would suffice to produce somewhat similar effects. This speaks well for the electrical components assigned to the two lines, and for the arrangements adopted in working them. It also shows the benefit derived from seven years' extra experience in manufacture, backed up by the previously-mentioned exhaustive Government inquiry thereon. Notwithstanding the dimensions of the core, these cables were worked slowly at first, and at a rate of about eight words per minute. This, however, soon improved as the staff became more accustomed to the apparatus, and steadily increased up to fifteen and even seventeen words per minute on each line, with the application of condensers. In no other respect is the contrast between wireless and submarine telegraphy more striking than in the amount of electrical energy required for transmitting messages over the same distance. Being so constructed as to send out the waves in almost all directions besides the particular one for which the message is intended, an ordinary wireless outfit must imply a tremendous waste of energy as compared with the ocean cable in which the current is all concentrated in one delicate receiving mechanism. So delicate is the latter that messages have been sent not only across the Atlantic but for double the length of the oldest Atlantic cable with the current from a silver thimble battery. This is what the famous electrical engineer of the Atlantic Telegraph Company, the late Latimer Clark, described briefly in a letter dated at Valcntia in September, 1866: "With a single galvanic cell composed of a few drops of acid in a silver thimble and a fragment of zinc weighing a grain or two, conversation may easily, though slowly, be carried on through one of the cables or through the two joined together at Newfoundland to form a loop. And, although in the latter case the spark, twice traversing the breadth of the Atlantic, had to pass through 3700 miles of cable, its effects at the receiving end are visible in the galvanometer in a little more than a second after contact is made with the battery. The deflections are not of a dubious character, but full and long, the spot of light freely traversing a space of 12 to 18 inches on the scale; and it is manifest that a battery many times smaller would suffice to produce similar effects." Of course every forward step towards concentrating or directioning the wireless waves will reduce the energy required for transmitting messages by the same, but we evidently have a long way to advance before our wireless methods can be at all compared in efficiency with the submarine telegraph of even 45 years ago.